1. I would, first of all, like to extend to you and through you, to all the women of India, my warm greetings and hearty felicitations on the occasion of International Women’s Day. 2. We, in India, have been celebrating this day by recalling the heroism and unparalleled legacy of some of the great women in India’s history - that continues to inspire our vision and efforts for women’s empowerment in our country. 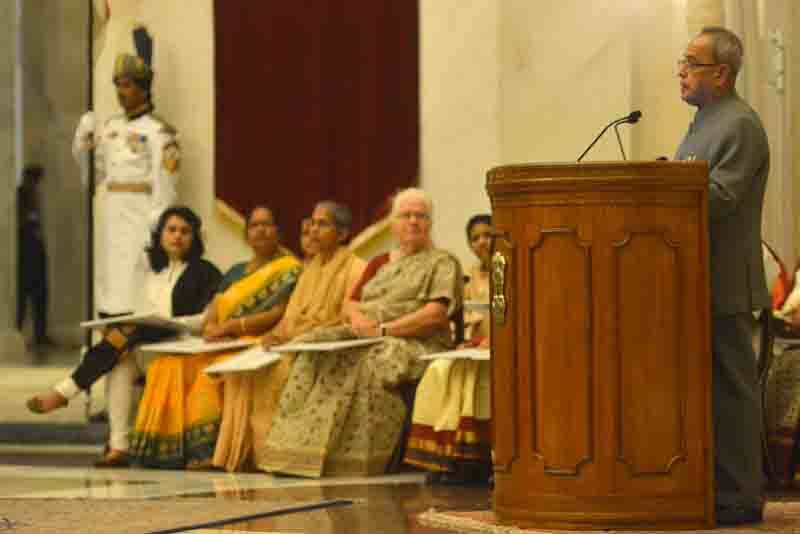 It is only fitting that Government of India pays tribute to these iconic women by conferring, every year, national awards in their names to outstanding contemporary women who have made an uncommon contribution to women’s empowerment. 3. As we know, "shakti”, in Sanskrit, denotes a concept and a personification of feminine creative power. ‘Stree shakti’ denotes the ability of women to be in command of their lives and regulate themselves in social, political and economic terms It means that they have the power to move from the periphery of society to its mainstream and wield influence from its core. 4. I am glad to see that we have instituted eight additional Nari Shakti Awards. I am also very glad to see that all the awardees have, through their exceptional endeavours, strong grass root presence and deep insight into women’s concerns, made inspiring initiatives for the empowerment of women. 5. Ladies and Gentlemen, I would like to take this opportunity to convey my heartfelt appreciation of the countless women who are the silent backbone of our economy. They toil shoulder to shoulder with our men in the agriculture sector for our food security, in factories for our nation’s economic growth, they work on project sites to build our national infrastructure and they strive in corporate offices and in banks. As professionals, they are second to none in their achievements and their services as doctors and nurses, as space and nuclear scientists and in Government offices and politics are invaluable in forging a path of progress and growth for our people. 6. Therefore, it is only appropriate that we should remind ourselves that the empowerment of women and their equality, liberty and dignity are not a distant goal or fond aspiration of the women of our country. It is one of their sacred rights. It is not a privilege that they should seek. It has been a key element in the codes of conduct that our ancient societies prescribed for themselves more than 3000 years ago. In the Vedic civilization, women were always given the highest level of respect and freedom and at the same time, their protection and safety was a sacred duty of society. This is our culture, this is our heritage. We should not allow ourselves to forget this. When the founding fathers of independent India drafted our constitution, they ensured that its principles and provisions duly emphasised women’s rights and equality. Our Central and State Governments have been duly prioritizing women’s development. 7. There are, nevertheless, enduring societal perceptions and attitudes which inhibit the pace of improvement in the condition and position of Indian women in our society and economy. These call for urgent individual as well as collective introspection. We must identify these weaknesses and their root cause. We must make the required effort to remove the structural and institutional barriers that inhibit the economic and social transformation of women in India. For example, violence against women continues to threaten the safety, well being and potential of women and girls across our country. Even their perception of their respective vulnerabilities constrains their freedom of movement and access to education, work and essential services. 8. The pace of progress in providing the desired level of safety and security to our women needs to be hastened through better enforcement of legislation towards this end. There is an urgent need for all our people to be more conscious of their attitude and demeanour towards women. I cannot emphasise enough that all women must be addressed and treated with due respect and courtesy. This training should be given to our children from a very young age. 9. The key issue, that must be stressed, is that for true empowerment, an effective convergence of all aspects impacting a women’s life is required - be it social, economic or political. Due to cross-cutting linkages and the interrelated dimensions of a holistic approach to empowerment, absence or weakness of efforts in even one area will lead to a failure in the sustainability of outcomes or the momentum generated by the other components. Therefore, such an engendering process has to be built into our Government schemes. Some of the best practices adopted by States and Union Territories for development of women need to be identified, adopted and up-scaled in Government of India schemes. The efforts and initiatives of women’s groups and the wide network of non-governmental organisations should be built upon by Central Ministries / Departments. 10. Ladies and Gentlemen, let us, on International Women’s Day, reaffirm our commitment to ensure gender equity and empowerment of women in India to enable them to realize their full potential and participate meaningfully in all aspects of our country’s development. 11. With these words, I once again congratulate the winners of Stree Shakti and Nari Shakti Puruskar. I thank the Ministry of Women and Child Development for organizing this event and encouraging the distinguished awardees to work towards a noble cause.